How many crackheads just out of rehab do you see the Texas Rangers giving gainful employment? How many cocaine addicted street hookers pimped out by their drug dealers and offering quick services in Lower Manhattan are getting lucrative baseball jobs in an effort to save them? What are the job prospects of a known addict who can’t be trusted to carry cash? It’s hard for people with these issues to get any kind of a job, let alone one that pays them as well as what Josh Hamilton is paid. 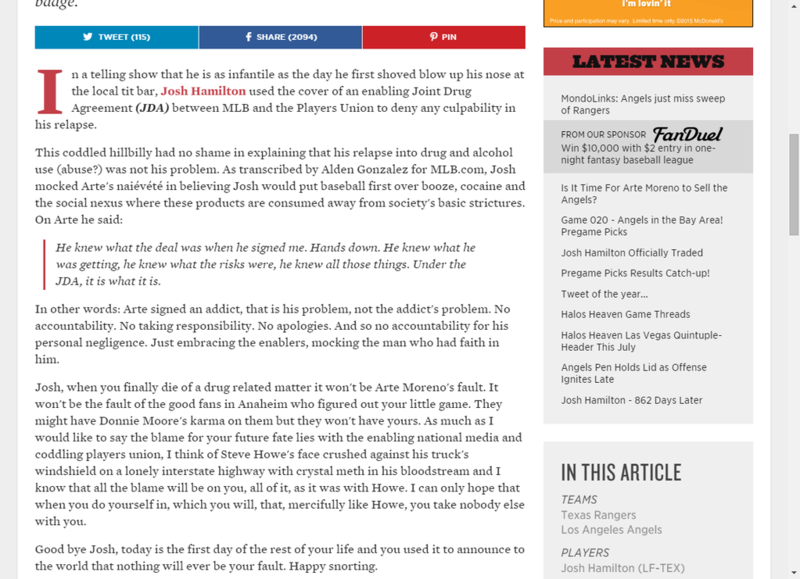 So let’s not act as if the Los Angeles Angels of Anaheim, the Rangers or anyone else who’s dealt with Hamilton on a professional basis was indulging in a philanthropic attempt to assist substance abusers. This isn’t a societal cleanup nor is it a selfless attempt to save a life. The Angels gave Hamilton that $125 million contract because they felt they could use his bat and he’d maintain his sobriety. They were wrong. The Rangers took him back for a pittance because they’re a reeling organization, saddled with terrible contracts, and declining fan attendance. Maybe Hamilton can help them with one or all of those problems. There’s a reason why all of this is happening and it’s not human kindness. He was allowed to nearly toss his career away with drugs and given numerous other chances because of the same gifts that made him the first overall pick by the Tampa Bay Devil Rays in the 1999 draft. Whether the self-abuse has finally caught up to him physically is something that will be determined once he’s back on the field, an event that should be coming in the next several weeks. He’s getting chance after chance because he could once hit a baseball nine miles. If that wasn’t the case, his former employers might be willing to help him, but there would be a clear limit to how far they’d go. While most people in baseball will say they hope for the best for Hamilton, there’s also an undercurrent of head shaking and “you did this to yourself” finger wagging. The political correctness that rules the day will preclude that from being clearly stated by the vast majority, but it’s there. The explanation – not an apology – that the author of the original post gave was illuminating as to what led to the post in the first place. It’s not meanness. It’s not a lack of caring. It’s a complete absence of accountability and focus on the self in opposition to providing intelligent foundation for discourse. It was an angry Angels fan who had undoubtedly said equally incendiary things about other subjects in the past but got away with it because there wasn’t the enraged backlash as there was to this last, blaze of glory act that ended up getting him tossed from the site. Let’s not turn SBNation into a credible news organization. It’s a forum and a niche site with advertising, promotion and significant financial backing. That doesn’t make it credible. We’re not talking about a New York Times or Wall Street Journal editorial. It’s not even a Keith Olbermann Special Comment. It’s a schlock site with a vast proportion of fans who are expressing themselves. Sometimes that will come out as offensive. There’s an arrogance that comes from public attention and the perception of success regardless of the quality of what’s presented. Those who find themselves getting paid for what these sites truly need – content and web hits – equate paid writing gigs with an ability to write; to analyze; to editorialize; to assess. In today’s world, there’s often not a connection between the two. Had it not been so fresh an issue and no one paid attention to what was written, then there wouldn’t have been the uproar. They fired the writer. He claims they mutually parted ways. Their version of SBNation’s oversight was to reference the platform’s policies when it comes to content. The reason this happened is, as with most bloggers, there was no actual interaction between the writer and the subject. Because this was dealt with in a way to assuage the masses who felt that the post was line-crossing, it doesn’t mean that there’s true regret. Had the percentages been reversed and the public reaction to Hamilton’s relapse been 90 percent as disgusted with him as the Halos Heaven writer was and 10 percent calling for compassion, there would have been applause instead of public shaming and a loss of employment. That’s the reality. The person who ran Halos Heaven was bad for business and that’s why he’s gone. Not due to the Hamilton post. That’s simply a byproduct. Let’s take a look at the remaining schedules for all the teams still in the hunt for an American League playoff berth. The Red Sox have the best record in the American League by five games. They’re going to have a significant say in which team gets the second Wild Card given their six games against the Orioles and four against the Yankees. They’re not going to lay down as evidenced by manager John Farrell’s somewhat odd – but successful – decision last night to use Koji Uehara is a tie game that meant nothing to them. I’m wondering if Farrell has received advice from Patriots coach Bill Belichick on going for the throat at all costs because it was a Belichick move. They don’t seem to have a preference as to whether they knock out the Yankees, Rays or Orioles. They’re playing all out, all the way. The A’s lead the Rangers by three games and have three games with them this weekend. Strength of schedule can be a dual-edged sword. This isn’t the NFL, but teams whose seasons are coming to a disappointing close are just as likely to get some motivation by playing teams that have something to play for as they are to bag it and give up. The Angels have played better lately and the Mariners can pitch. The Tigers’ upcoming schedule is pretty weak and they have a good cushion for the division. They can’t coast, but they can relax a bit. The Rangers are in jeopardy of falling out of the playoffs entirely if they slip up over the next ten games. All of those teams have something to play for and the Rangers have been slumping. With the way they’re currently playing (think the 2007 Mets) they’re not going to right their ship in time to make the playoffs. They’d better wake up. Fast. There’s a reluctance to say it, but the Yankees are better off without this current version of Derek Jeter. He was hurting the team offensively and defensively. Their problem has nothing to do with schedules or how they’re playing, but with age and overuse. They’re hammering away with their ancient veterans for one last group run. Mariano Rivera is being repeatedly used for multiple innings out of necessity; Alex Rodriguez is hobbled; David Robertson is pitching hurt; Shawn Kelley isn’t 100 percent; Andy Pettitte is gutting his way through. If they’re in it in the last week, will there be any gas left in their collective tanks? The White Sox are playing about as badly as the Astros without the excuse of lack of talent/innocent youth. They just don’t seem to care. The Indians’ schedule pretty much guarantees they’ll at least be alive in the last week of the season. The Red Sox are taking great, sadistic pleasure in hampering the playoff hopes of anyone and everyone and have shown no preference in who they’re beating on. This will hurt and/or help the Orioles. The big games to watch are those four with the Rays. I’d like to see the Royals make the playoffs because: A) they’re a likable young team; B) we need some new blood in the post-season; and B) the likes of Rany Jazayerli, Rob Neyer, Joe Sheehan and the rest of the stat-obsessed “experts” who live to bash the Royals will either have to admit they’re wrong (unlikely) or will join together to play a disturbing game of middle-aged men Twister (hopefully clothed) to justify why they were “right” even though Dayton Moore’s moves worked and the Royals leapt into contention and more. It will be nice having an experienced arm like James Shields for a one-game Wild Card playoff or for the first game of the ALDS. I have a feeling about the Royals making the playoffs. And it’s gonna be funny. Regardless of what happens in today’s game against the Red Sox, the Yankees are still going to be in position for a run at the last realistic Wild Card spot. Ignoring that they’re injury-ravaged, have no pitching left and are staggering toward the finish line, that is not going to change in the next several days at least. No matter how many times we hear the mathematical probabilities from the New York Times, the truth about their current and future state from the New York Daily News and Mike Francesa’s death bed postmortem, the fact remains that the Yankees are still only 2.5 games behind the plummeting Rays and 1.5 games behind the Orioles and Indians. They have a four-game series in Baltimore this week and, obviously, if they pitch as they have against the Red Sox the real funeral for the Yankees of 2013 will be underway. But now? No. They’re a three game winning streak and a little luck away from suddenly being in the lead for the second Wild Card. Of course, one thing that many seem to ignore is that making the playoffs with the Wild Card isn’t a guarantee of anything beyond one extra game. Given how battered the Yankees are and that the team they’re going to play in the game is the Athletics or the Rangers, their chances of advancing even if they make it that far are weak. They’re old and in significant transition. The overwhelming likelihood is that they’re as done as the above-linked articles say. The idea that they were “the team no one wanted to face,” or other clubs were feeling the Yankees’ breathing down their necks, or that the old warhorses Derek Jeter, Alex Rodriguez and Andy Pettitte still had something to say in the playoff race were no more than reminiscing for remember when. Pettitte has been good and A-Rod has had his moments. Then we come to Jeter. The decision by manager Joe Girardi to pull Jeter from yesterday’s game was made because he didn’t like the way Jeter was running. It’s clear that he’s nowhere near 100 percent. In fact, he’s probably at around 70 percent. His range, never that great to begin with, is even worse; he’s not hitting; he’s not helping the team on the field. All the talk of the lineup not looking the same without him in it and how his mere presence in the lineup is a lift for the team is a politically correct thing to say to play up Jeter’s value. Except his current value isn’t all that much. He can lead from the clubhouse and they can put someone into the game who’s going to provide more on the field and considering that someone is Eduardo Nunez, that says about as much about what Jeter can currently do as anything else. This could change within the next 2-3 days, but the fact is that the Yankees are still in contention no matter what the numbers and opinions say. Your word of the day is misogynist. I didn’t realize that Matt Garza’s statements were so important that when he says something that is viewed as offensive to women it elicits the strong response and bandwagon jumping we’re seeing from those who are acting angry or trying to make themselves sound progressive. Garza needs to grow up and accept the fact he got beat on the field fair and square. It’s a unique skill to combine elementary school simplicity with parental scolding and self-indulgent solidarity. All that’s missing is a “Nyah, nyah, nyah” at the end. What you have is women clutching at this like the newest-latest of reasons why they’re disrespected and men who try to make sure they’re onboard and won’t be the next target of the angered masses.The race/gender card is so cheap and easy to use that few even dare to use it anymore unless they have nothing else to say or are desperately seeking attention and approval. If a person’s gender or sexual orientation is used as a reason to denigrate their opinion, it’s a pretty good bet that the person doing the denigrating isn’t all that bright to begin with. So why the over-the-top reaction? In and of itself, this “story” is ridiculous. Garza should probably have thought twice before choosing to engage in this kind of diatribe, but he’s right in his last tweet of the day when he basically told people if they don’t like him, don’t follow. It’s that simple…unless there’s an ulterior motive. And in this case and any case in which there’s a perceived or crafted offense against a gender or group, there’s a clear ulterior motive of individuals drawing attention to themselves by latching onto this silliness to further their own ends and taking off with it like Usain Bolt at a track meet. What we see from women who are mock-offended by Garza is another opportunity to express how unenlightened some men are as to the battle of the sexes and that statements such as those made by Garza are “hindering” their cause. Except it’s not hindering their cause. Much like Keith Hernandez’s rant about the Padres’ female trainer being in uniform in the dugout and Rob Dibble’s sexist comments in the broadcast booth, these are not men in a position of power where it matters what they say. Self-righteous political correctness is exponentially worse than political correctness. If it were a GM or an owner who said something like this, then it’s a reason to reply with a level of force. It’s Matt Garza. Unless there’s an agenda, who cares what he says? If there are a trail of bodies or body parts scattered from Cleveland to Philadelphia to Seattle to Texas and back to Philadelphia, be on the lookout for this man. What is Cliff Lee’s problem? Never mind that his All-Star look was more appropriate for a man awaiting a decision as to whether or not he’d get the death penalty and the question as to whether he’d ever learned to fake a smile and tip his hat. This isn’t about that face which would make a hardened criminal or sociopathic dictator think twice before messing with him, but it’s about the repeated trades of Lee and how he’s seemingly always up for discussion in trade talk. We’ve seen instances of him glaring at teammates who make errors behind him and even confronting them as he did with Shane Victorino. Much like the B.J. Upton–Evan Longoria incident when Longoria questioned Upton as to why he didn’t hustle on a ball hit in the gap, it obviously wasn’t the first time that players, coaches and the manager spoke to Upton regarding his lackadaisical play. Lee’s name prominently featured in trade talks, his strange history as a journeyman in spite of how good he is and that face make it a viable question as to whether he’s worth the aggravation unless he’s pitching like an All-Star. Is Lee a clubhouse problem? While his teammates appear to respect his commitment and status as one of the top pitchers in baseball over the past five years, it reverts back to wondering why he’s always a negotiable topic in trade discussions. With the Indians the trade to the Phillies was spurred by his contract status, that the team was rebuilding and they wanted to maximize his value rather than lose him for nothing a year-and-a-half later. With the Phillies, the club got the idea that he wanted to test the free agent waters after the 2010 season and they preferred someone who was with them for the long-term in Roy Halladay while simultaneously maintaining some semblance of a farm system. Lee denied that he told the Phillies he didn’t want to negotiate an extension prior to the trade. With the Mariners, the club was in the midst of a disastrous season in which the planned dual-aces at the top of their rotation with Felix Hernandez and Lee wasn’t working out and they traded him to the Rangers for a large package of youngsters. Lee certainly didn’t look any happier with the Mariners than he did during the All-Star introductions. He went back to the Phillies after the 2010 season, spurning the Rangers and Yankees. Whether or not Lee is a clubhouse problem or is just an introverted, intense competitor who lets his emotions get the better of him is known only to his teammates and the organizations he’s played for. With Lee, though, there’s been a smirking shrug when things aren’t going his way as if it’s not his fault. The Phillies’ decision to trade Lee once was based on pure business practices. When the parties reunited after backbiting and back-and-forth accusations as to what went wrong the first time, it was viewed as Lee liking Philly better than New York and the Phillies offering more money than Texas. For the Phillies it was an overt admission of the initial mistake in trading Lee. Given their continued willingness to listen to offers on Lee, it’s clearly evident that the relationship is still a business one. Lee didn’t want to bring his family to New York where his wife had a bad experience during the playoffs against the Yankees while he was pitching for the Rangers. The Phillies wanted to build a juggernaut. Both got what they wanted. Currently there is speculation that the Phillies might trade Lee if they decide to sell at the trading deadline, but they’ve said they’re not going to. It’s not because they’re in love with Lee, but because they think they’re still in contention for 2013 and will be in contention in 2014, so they’ll be a better team with Lee than they would be with the prospects he’d bring back or the players they could sign with the money freed up after getting his contract off the books. Lee doesn’t sound as if he’s all that bothered by the trade talk. His attitude and that face indicate he’s treating the game as a business and if he’s traded, that’s part of the deal. He’ll get paid and will escape another town and use his glare to scare off onlookers yet again in a new venue. Manny Ramirez will either wind up like Muhammad Ali or George Foreman. With Ali, his final comeback attempt (not counting a last-last, this is definitely the last fight in 1981 in which he lost to journeyman Trevor Berbick) came when he took a ferocious beating from a reluctant, in-his-prime heavyweight champ Larry Holmes. Ali went to great lengths to show what great shape he was in prior to the fight by getting back to the weight he fought at when he defeated Foreman in Zaire. But the fact that he was in shape didn’t matter. Holmes battered him in a perfunctory manner and, by the end, was screaming at the referee to stop the fight before he seriously injured Ali. Ali certainly didn’t need the money nor the increased number of blows to his already damaged brain, but he couldn’t stop himself from seeking the limelight and that one last shot at glory doing the one thing he truly knew how to do better than anyone else. With Foreman, he was ridiculed when he came out of retirement and is still looked at with a jaundiced gaze by saying God told him to do it. He was overweight and old, but the laughter ended when he showed he still had the punching power and savvy to win fights. He put up a great show when losing to Evander Holyfield and eventually knocked out Michael Moorer to regain the title he’d lost twenty years earlier to Ali in 1974. With Ramirez, he is returning after a stint hitting against, in boxing parlance, tomato cans in Taiwan. In Taiwan, they’re professionals and they’re talented, but they’re not on a level with a good Double A team in North America. While there, he was hitting subpar pitching in accumulating a .352 average, .422 OBP, and eight homers in 49 games. Abruptly leaving his Taiwanese team—the EDA Rhinos—Ramirez was rumored to be heading to Japan before deciding he’d like another shot with an MLB team. No one seemed interested until the Rangers decided to take a chance on him. The question is, can he help them? Ramirez hasn’t played with a major league team since he went 1 for 17 for the Rays in 2011 before walking away and subsequently being caught failing another PED test. Amid much fanfare in an otherwise dreary off-season for the Athletics in the winter of 2011-2012, he was signed to a minor league contract. At that point, the A’s were embarking on another rebuilding project and for half the season, played as poorly as predicted before a sudden hot streak vaulted them into the playoffs. No one knew they could achieve those heights when they signed Ramirez and they needed him to sell a few seats with the mere hint of him being in the big leagues as a sideshow. In a best case scenario, he’d attract a few fans and hit well enough for the A’s to trade him to a contender (because not even Billy Beane thought they’d contend in 2012); worst case, they’d release him. He batted .302 in 63 at bats for Triple A Sacramento with no homers. The A’s released him last June and he went to Taiwan. Can the Rangers expect anything from him? Like the decision on the part of the A’s to sign him, this is a test case for team benefit. The Rangers are contenders and need a righty bat. The trade deadline is July 31st and the Rangers are aggressive and active in improving their team. With a month to go before the time comes when they’ll have to make an acquisition along the lines of Mike Morse to boost their righty power, it’s cheaper and zero risk to look at Ramirez and get an answer as to whether he can still hit. Like Ali’s last fight, it could be a “would you stop it already?” moment. Or it could be an out-of-shape former star who shows he can still perform as Foreman did. The odds are it’s the former and even if the evidence is clear that Ramirez needs to hang it up, he probably won’t. Either way, there’s no risk for the Rangers to have a look. I’m not accusing Davis of anything nor am I putting forth a defense, but to imply that there shouldn’t be suspicion about any player who experiences this kind of half-season after never having posted anything close to these number in his major league career is ludicrous. On the same token, just because he’s hitting home runs with this frequency doesn’t mean he’s cheating. When a player explodes like this, there will be questions asked as to how he did it and, given the era in which we live where everyone’s suspect, it’s fair for them to be asked. It happened with Jose Bautista and Raul Ibanez in recent years and neither had their names come up in a Biogenesis-type record, neither was caught with anyone who was involved in PED use, and neither failed a test. The talk died down. But realistically, is there any player—one—who would elicit shock and dismay if he was caught having used PEDs? And that includes Mariano Rivera, Derek Jeter, David Wright and Joe Mauer among the “oh, he’d never do that” brigade of players seen as aboveboard and honest. Some might be more disappointing than others, might create a splashier headline and bigger scandal, but shock? It’s like the story that Mickey Mantle might have used a corked bat in his career: it ruins the narrative and childhood idol worship of a vast segment of the baseball-watching population and turns into anger and denials based on nothing. I don’t know whether Mantle used a corked bat and nor do you. This is identical to the response to any player being accused of having used PEDs and the public and factions in the media saying, “No way.” You don’t know. There are reasonable, baseball-related explanations for Davis’s sudden burst into stardom. He’s locked in at the plate; John Kruk discussed his balance and timing in getting behind the ball with all his strength; he posted minor league numbers nearly identical to the ones he’s posting now; and if he was going to use PEDs, he only decided to do it for 2013? What about from between 2008 to 2011 when he showed flashes of talent but struck out so much that he looked like he was on his way to becoming Adam Dunn, wound up back in the minor leagues for long stretches, and the Rangers traded him to the Orioles? The number of players who’ve stood in front of cameras, congress, baseball executives and law enforcement officials and lied to everyone’s faces is so vast that it is naïve to exonerate any out of hand. There’s no evidence—circumstantial or otherwise—against Davis. Accusing him with an insulting, “he must be juicing,” is wrong, but exonerating him is only slightly less wrong because neither I nor you nor anyone else other than Chris Davis knows whether his first half is due to fulfilling his talent or getting his hands on some high quality, undetectable PEDs. Click on these links to read part I and part II. Jon Daniels is a popular and well-respected GM today but that wasn’t the case when he took over for John Hart in October of 2005 and one of the first big trades he made sent Adrian Gonzalez and pitcher Chris Young to the Padres for Adam Eaton and Akinori Otsuka. That will go down as one of the worst trades in the history of the sport. If he was able to rebound from that and craft the Rangers into an annual contender with a reasonable payroll and deep farm system while dealing with the alpha-male presence of Nolan Ryan and navigating his way through the financial woes of former owner Tom Hicks, then he’s got something on the ball. Daniels got the GM job very young at 28 and clearly wasn’t ready for it, but grew into the job and is not a stat guy or scouting guy, but uses every outlet at his disposal and is also able to do the dirty work mentioned earlier to consolidate his power. Just ignore Moneyball for a moment when thinking about Billy Beane. Look at his body of work without the accolades, best-selling book and ridiculous move to accompany the star status Beane’s cultivated and persona Beane has created and look at his work objectively. Is he a good GM who worked his way up through the ranks from scouting to assistant GM to GM to part owner? Yes. Would he be as lusted after without that ridiculous bit of creative non-fiction known as Moneyball? No. It can be argued that Moneyball has done an exponential amount of damage in comparison to the good it did in introducing the world at large to statistics that they would not otherwise have realized existed. Due to Moneyball, everyone thinks they can study a spreadsheet, calculate some numbers and suddenly run a big league baseball team. One of the under-reported aspects of Moneyball is that Beane played in the Major Leagues with a nondescript career as a journeyman when he was talented enough to be a superstar. It’s part of the narrative that made the Beane story so fascinating, but now that he’s become this totem many of his worshippers probably aren’t even aware that he played at all. Beane had a perfect storm when he took over as GM. There had been a brief Sports Illustrated profile of him and his transition for player to scout and he was known in MLB circles as an up-and-comer, but the Athletics were so bad and so consistently bad for several years due to financial constraints that Beane was able to implement the strategies of statistics into his player procurement. It worked because no one else was doing it or paying big money for players who didn’t just get on base, but had undervalued attributes. Beane’s “genius” has been a media creation. He’s been smart, he’s been lucky and he’s also been unlucky. He’s crafted the image of the brilliantly cold corporate titan when it’s not true. He’s a former player who entered the front office, took advantage of the opportunities presented to him and has been successful. A large part of that is due to the circular nature of Moneyball giving him the freedom and leeway to make bad trades and have half-a-decade of futility in which he blamed everyone but the man in the mirror and still kept his job. Jerry Dipoto has two issues that are tarnishing his reputation as a GM. One, people don’t remember that it was Dipoto, functioning as the interim GM of the Diamondbacks after Josh Byrnes was fired in 2010, who made two trades that have paid significant dividends to the current Diamondbacks by acquiring Patrick Corbin and Tyler Skaggs for Dan Haren and getting Daniel Hudson for Edwin Jackson. Two, he’s overseeing an Angels team that has played better recently but is still in rampant disarray with overpaid, underperforming players; a manager who has had his own power within the organization mitigated by the hiring of Dipoto; and is trying to rebuild the farm system in his own way with scouts he knows and a new school sensibility while the owner wants a championship now and the manager has a contract to 2018. It’s highly doubtful that Dipoto wanted to commit so much money and so many years to the likes of Albert Pujols and Josh Hamilton. Dipoto was a journeyman relief pitcher who scouted and worked in many front offices with varying philosophies before getting the Angels job and is a qualified baseball man. It’s difficult to know what he’s wanted to do with the Angels and what’s been forced upon him. If the situation really comes apart, he might be cleared out with the rest of the Angels hierarchy and have to wait to get another opportunity due to the damage done to his reputation with what’s happening with the Angels. The ice is cracking under the feet of Jack Zduriencik and if he is eventually dismissed he will be a cautionary tale that no one will listen to when anointing the next “genius” by giving credit for that which he had nothing to do with. After the fact, if you ask Zduriencik what his biggest regret is, it’s likely to be that the Mariners had such a luck-filled rise from 101 losses the year before he arrived to 85 wins in his first year on the job. It accelerated the process spurring the trade for Cliff Lee and drastically raised the expectations. Unsurprisingly the expectations were not met; much of Zduriencik’s subsequent moves have gone wrong and if he is indeed fired, the next GM will likely benefit from the farm system seeds Zduriencik planted. That brings me to the next point: there are GMs who are better-served as assistants, farm directors, scouts, and other lower-level positions in an organization. It may not be as flashy, but is no less important and for all the talk of “GM prospects,” it must be examined whether or not the person will be able to do all aspects of the job as an overseer rather than as an underling. Jeff Luhnow is not only getting a pass for the horrific Astros club he’s put together—that is on a level with an expansion team—but for the Cardinals fertile farm system that is continually producing players. The draft is a communal effort and not one person deserves or should receive all of the credit in the same manner that a GM shouldn’t get the blame if drafts go poorly. Luhnow didn’t work his way up in baseball and was a private businessman when Cardinals owner Bill DeWitt hired him. This infuriated the old-school people in the Cardinals organization namely Walt Jocketty, Tony LaRussa and Dave Duncan and created factions between the stat people and the scouting people that eventually resulted in Jocketty’s firing. Luhnow also lost the power struggle to LaRussa in the months prior to leaving the Cardinals to take over the Astros. If nothing else, it was the experience in trying to transition into a baseball front office that has shaped Luhnow’s building of his Astros staff and construction of the roster from the top down as he’s got people who are going to do things in the stat-based way and are told before they’re hired how it’s going to be or they’re not going to get the job. Of course the portrayal of Luhnow as the newest/latest “genius” and musings as to when (not if) he’ll be the subject of the new Moneyball are absurd. In four years he could be in the same position as Zduriencik or he could be Andrew Friedman. Know this: Astros owner Jim Crane is not going to accept failure and if the Luhnow project doesn’t work all the trust and belief that Crane has put into the Luhnow experiment will be quickly forgotten if the team doesn’t show concrete results on the field.